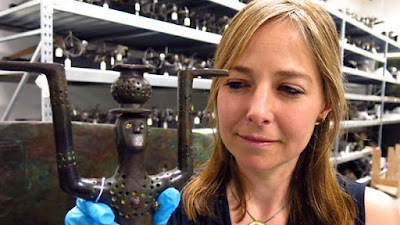 A new three-part documentary series called The Celts: Blood, Iron and Sacrifice, with Alice Roberts (pictured) and Neil Oliver, is starting tonight, Monday, 5 October, at 9pm on BBC2. It ties in with the exhibition Celts: Art and Identity at the British Museum. In this 3x60’ series for BBC Two, anthropologist professor Alice Roberts and archaeologist Neil Oliver go in search of the Celts - one of the world's most mysterious ancient civilisations. Neil and Alice explore the origins and beliefs of the Celts, their highly sophisticated tribal culture and enduring influence on vast areas of the ancient world. In the first episode Neil and Alice explore the origins of the Celts in the Alps of Central Europe and relive the moment the Celts first came in to contact with the Romans, in a pitched battle just north of Rome. And Alice uncovers a controversial new theory, based on mysterious stone carvings on the Atlantic coastline of Portugal. Along the journey they discover that, far from being confined to Britain and Ireland, the Celts once dominated swathes of Europe. They uncover ancient Celtic artefacts and human remains from Turkey in the east to Portugal in the west and reveal the significance of pivotal battles that took place between the Celts and their arch-rivals the Romans - and how these very conflicts came to define the future direction of European civilisation and the shape of our modern-day world. The series is rich with vivid drama reconstruction, and new discoveries, helping recreate this pivotal era. Sounds like a series no pagan with any interest in Celtic history would want to miss. NICE SERIES BUT I HATE THE WAY EVEN THE MOST INFORMED HISTORIANS IGNORE THE FACT THAT CELTIC ARMIES WERE MADE UP OF MEN AND WOMEN, THIS IS NEVER SHOWN. THEY REFER TO ROMAN HISTORIANS, WELL THEY ARE THE ONES WHO LEAVE US WITH THE RECORD THAT CELTIC ARMIES WERE USUALLY HALF WOMEN FIGHTERS! MORE HIDDEN HISTORY?